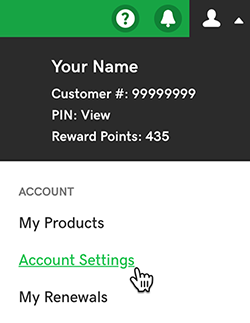 We keep track of all your purchases in your account's Order History. Follow these steps to see and download your GoDaddy invoices. Click Order History. The My Receipts list shows purchase numbers/dates and the amount spent. To find a specific receipt, you can use the Filter by options. To export your receipts to a CSV file, click Select All and then click Export to CSV. Or, click the check boxes to select individual receipts to export. 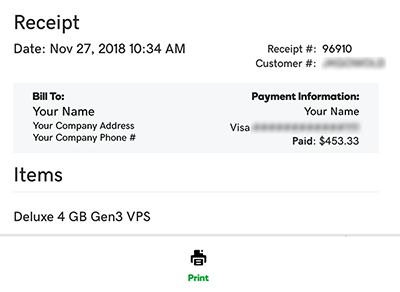 Click any receipt number to see more details, including the billing address, payment information and the product purchased (you may need to scroll to see all items on the receipt). If you need a hard copy, click Print. Most products auto-renew by default, but you can turn off auto-renew for a product at any time. You can add additional payment methods to your account at any time. You can delete payment methods that you don't want to use, as long as none of your products are set to use that payment method. You can only add PayPal as a payment method when you use PayPal to buy a product.